With Christmas right around the corner*, you’re probably wondering why we’ve chosen mid-December to blog about weddings. Two reasons: First, a beloved member of the Bas Bleu family recently said “I do,” leaving us all feeling pretty sentimental. Second, weddings take time to plan, people! And if the happy couple you know has any chance of pulling together a literature-themed wedding by summer, they had better start planning NOW. Whether designing the entire day around a single beloved book or simply sprinkling bibliophilic touches throughout, what better way is there for bluestockings in love to begin an exciting new chapter of their lives? This Etsy artist hand-letters proposals that can be tucked inside your beloved’s current page-turner. Your clever literary decorations will be all for naught if no one’s there to see them! Take a page from these creative designers and brides-to-be to craft an unforgettable invite for your friends and family. This graphic designer creates wedding invitations based on the covers of Penguin classics. This wedding “book” details the happy couple’s meeting and courtship, ending with an invitation to their wedding. 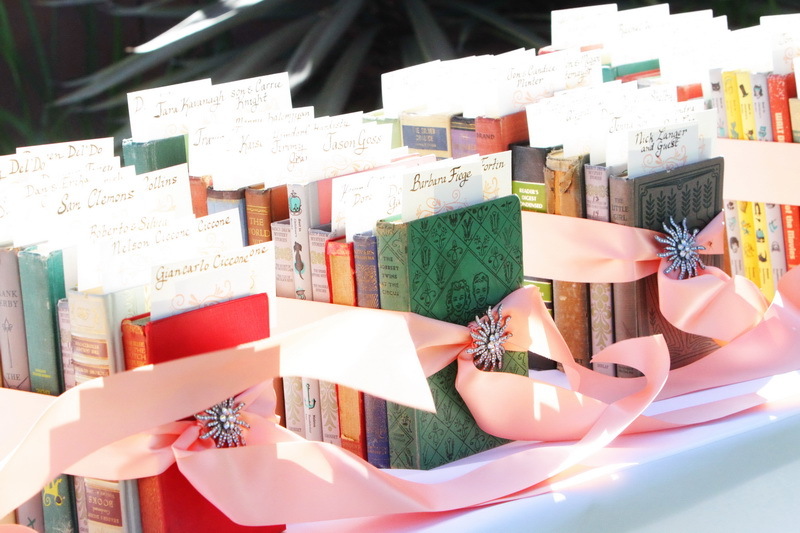 This imaginative DIY bride (and her loyal friends and family) repurposed dozens of old books as wedding invitations. We know how many of you feel about the destruction of any book, but you must admit this is pretty ingenious recycling for those volumes destined for the trash! Location, location, location! Imagine saying “I do” surrounded by books in a quaint local bookstore or library. If your county branch isn’t terribly photogenic, investigate historic homes or other buildings that may be willing to rent out their bookish spaces. If you can’t snag the entire library for your big day, bring a bookish flair to whatever space you choose. Maybe your mother has strong opinions about a theme wedding, or maybe you simply prefer a subtle touch. 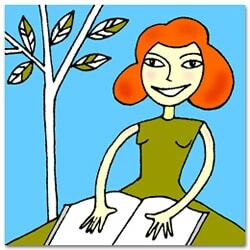 Here are several lovely methods for infusing your reception site with your love of literature. Guide guests to their seats with handy keepsake bookmarks that double as table assignments. Or invite them to search for their table assignments in a vintage card catalog. Or place colorful hardcovers among flowers and candles to serve as centerpieces. If going the wedding-favor route, skip the miniature picture frames and bags of Jordan almonds. Instead, browse used bookstores for secondhand classics. Wrap them up as favors or have them double as place cards (and conversation starters). This cake o’books includes “titles” based on 1 Corinthians 13. You could always opt for a traditionally shaped cake, decorated with your favorite literary quotations about love. How about a wedding cake designed around the theme of your favorite book? Which in this case happens to be George R.R. Martin’s Game of Thrones. As for this? This is commitment to theme. *A reminder for bluestocking Santas: Today is the deadline for Bas Bleu orders shipped by standard delivery to arrive in time for Christmas. Orders delivered via expedited shipping must be placed by noon on December 19 (for rush delivery), December 20 (2-day), or December 23 (for overnight shipping). This entry was tagged book crafts, bookish weddings, classics, recycling books. Bookmark the permalink.